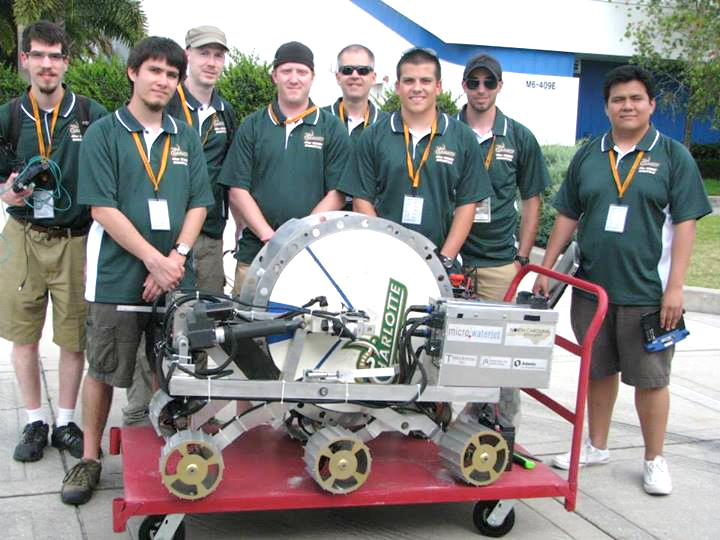 North Carolina Space Grant awards funding to undergraduate teams to help them participate in national competitions either sponsored or sanctioned by NASA or another STEM-related organization (NASA Student Launch Initiative, NASA Swarmathon, NASA Human Robotics Competition, Shell Eco-Challenge, AUVSI Competition, etc.). These competitions should be in the fields of science, engineering or mathematics, and complement the academic studies of the team members. Competitive awards will be granted with preference given to projects that lead to participation in national student competitions such as the NASA Student Launch Initiative, NASA Robotics Mining Competition, Shell Eco-Marathon Challenge, Swarmathon, etc. NC Space Grant anticipates supporting 6-8 team competition grants of up to $5,000 (based on available funding). Funds can be used to purchase supplies and materials to support the team project, and/or cover registration and travel expenses. A team may apply for only one award. However, the same college or university may apply for multiple awards as long as funds are used for different challenges or competitions. The period of performance for this project is November 15, 2018 to April 15, 2019 (5 months). Note: The end date is aligned with NC Space Grant’s FY 2018 period of performance with NASA. Once our office receives FY 2019 funding from NASA, we will be able to extend the end date of this award via no-cost extension. Proposal submissions will reopen in Fall 2019. For full submission guidelines, refer to the Request for Proposals (RFP). 1. Summary of the team competition (i.e., provide the web link). 3. Summary of team’s past participation in the competition (placement, lessons learned). 4. Outreach plan (not required but teams that include an outreach component to pre-college and public audiences will be more favorably reviewed). 5. Project timeline (goals, deadlines, requirements and competition dates). 7. Full project budget and description with request not to exceed $5,000; a one-to- one cost-match is required (use budget template in Appendix B). Curriculum Vitae of the Faculty PI/Advisor (2 pages max). Letter of support from the Department Chair/Head that outlines the importance of the proposed project to the department and the direction of the university. Budget and budget narrative with request not to exceed $5,000. A one-to-one cost-match is required (use budget template in Appendix A). Note: NASA training grant funds cannot be used to purchase equipment. NC Space Grant does not allow facilities and administrative costs. Un-recovered facilities and administrative costs may be used for required cost-matching. Proposals must be submitted as one PDF file. Proposals should be one-sided and single-spaced on standard 8 ½ x 11 paper, no smaller than 12 point font and with no less than one inch margins throughout. Text restrictions are inclusive of all illustrations, tables, charts, exhibits, etc. All pages must be numbered sequentially. Proposals must be submitted by the faculty advisor (PI) to jobi_cook@ncsu.edu by October 15, 2018. Submissions must include university’s authorized signature. Award announcements will be made by November 1, 2018. Projects selected for funding will receive a subaward through the PI institution’s Office of Sponsored Projects. Proposals will be accepted from teams at NC Space Grant Affiliate and Non-Affiliate institutions of higher education. Team members must be enrolled in an academic degree program. Please note: Some competitions require that team members be full-time students and/or U.S. citizens. Applicants should review all competition or program requirements and make sure the entire team is eligible to participate before submitting this proposal. Team representation and demo at the NC Space Grant Space Symposium, April 4-5, 2019 at the Stateview Hotel on NC State’s Centennial Campus (details coming soon). Work with the North Carolina Space Grant communications team to develop and implement a plan to share team progress and experiences, including but not exclusively on social media, in print, and on the NC Space Grant website. Make activity and results public via social media during and after their projects, using accessible social media accounts and consistent hashtags. NC Space Grant should be given credit for sponsoring the activity in all printed materials (logo, social media, etc). A final report on the team project is required (electronic). NC Space Grant is required by NASA to keep in touch with all awardees of significant programs at least until they receive their first job after receiving their highest degree. If you receive support through this program, expect to keep in touch with NC Space Grant for some time after the completion of your project (minimum info we’ll need is an updated e-mail address so we can contact you if required). For questions related to this solicitation, please contact Jobi Cook at (919) 515-5933 or jobi_cook@ncsu.edu.